A well-deserved second outing for the vertigo-inducing tropical terror? We check out an early Xbox 360 build. Blame the insipid Mercenaries 2: World in Flames, if you will, or Vin Diesel’s wrecked-from-birth Wheelman, or even Far Cry and Crysis, but I’m sick to the rear molars of games in which over-clocked Western secret service bruisers are slam-dunked into post-colonial scenery in order to flog their militaristic hard-ons in the name of international stability. It’s less a question of pinko liberal sympathies as familiarity-bred contempt: the old sub-equatorial geo-political sandbox is positively heaving with unshaven one-man-armies and their flaccid punchlines. Next time, developers, try rural Dorset. The weather’s not too pleasant, but they make wonderful cream teas. Such whinging aside, there’s always room for a game that’s utterly, spectacularly, triumphantly stupid, whether it’s set in Borneo or Birmingham, and Avalanche’s third-person pacification spree Just Cause 2 is certainly that. This stupidity hinges on two elements: a parachute, and a grapple line. Dang, I was aiming for the chap in the foreground. 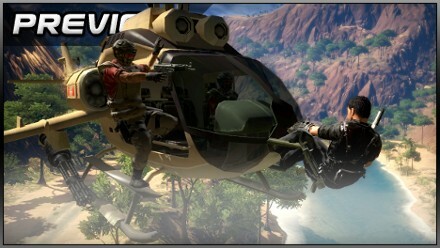 The former not only lets returning hero Rico Rodriguez take the scenic route out of each mission briefing, free-falling towards the game’s 1024 km square of highly diversified streaming island; it’s a tactical prop, allowing players to mount improbable low-level aerial assaults on whatever gas tanks and satellite dishes are next on the checklist, or kick up and away from the roof of a speeding car after tagging it with remotely detonated explosives. To open the chute, tap A; to cut yourself loose, tap A once again (don’t worry, Rico appears to have an inexhaustible supply). Tilting the stick forward accelerates your descent and forward momentum; tilting it backward has the opposite effect. The grapple line, mapped to right bumper, is even sillier. Fire it a building, tree branch or part of the landscape and you’ll reel yourself in; fire it at a movable object of lesser mass, be it a rock, grizzled government goon or an old lady riding a moped, and the converse is true. So far, so Bionic Commando, but the ace up the weapon’s sleeve is that it’s double-ended. Hold the bumper down after grappling one object and you can grapple another if you’re quick (providing it’s roughly within the same range and field of view), roping the two together with oft-amusing and hopefully lethal consequences. 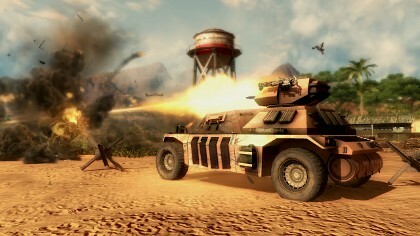 All the game's vehicles are driveable. There are very few people or things you can’t mistreat in this fashion, as the first mission we were shown made clear. 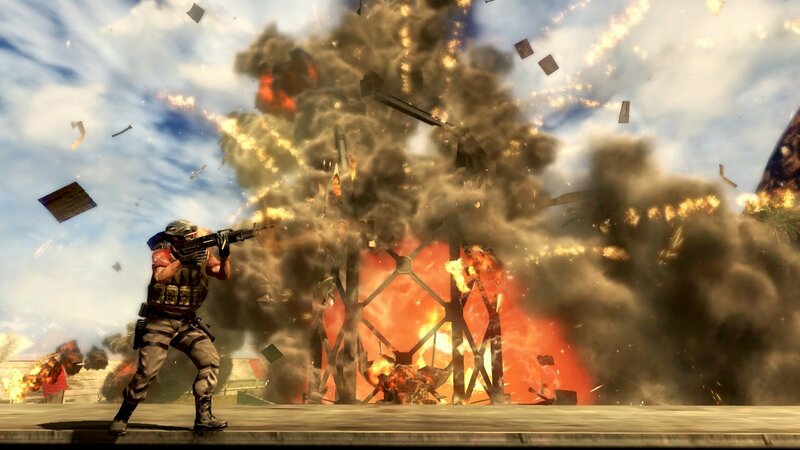 In the capable hands of “Al”, one of the game’s designers, baddies were lassoed to each other, statues, lamp-posts, cars, balcony edges and punctured gas cylinders, Rico’s dual-wielded shotgun and SMG barely getting a look in. Still more improbable feats are apparently in store if you’re skilled enough: boulders can be staple-gunned to helicopters to create highly mobile wrecking balls, or even hitched to passing jets. Nudged by waypoints on the top-left mini-map, Al clawed his way up the side of a glittering tubular skyscraper, disarmed a few ticking timers, then latched onto a boss chopper and dispensed of its pilot with a brisk bit of button-matching, just in time to spare a beleaguered fellow operative from the authorities’ rifle butts. A car chase followed, Rico riding shotgun on the roof, casually jolting pursuers out of their vehicles or anchoring the vehicles themselves to the tarmac. Everything looked decidedly awesome, Al’s premature death notwithstanding, and I was first in line for a pad once the lights came up. 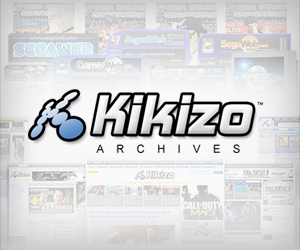 Posted in Previews, Spotlight, and tagged with Avalanche Studios, Eidos Interactive, Just Cause 2, PlayStation 3, PS3, shooter, Square Enix, third-person, Xbox 360.